This is an easy project we did the last time we went to the river. I call them "Wilding Sticks". 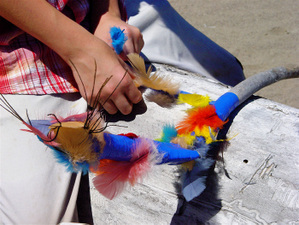 All you need is a variety of colorful electrical tape, scissors, and some feathers. 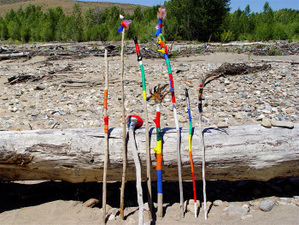 After you've collected the walking sticks, add the tape and feathers in whatever design is appealing. I think they're so cool to look at and the kids love using them. 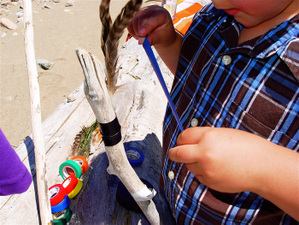 We also made these nature bracelets which were very easy. 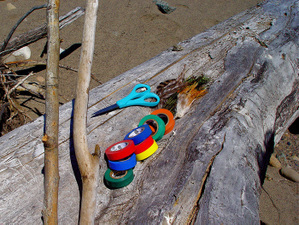 Make a bracelet of duct tape with the sticky side out. 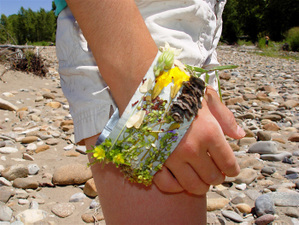 Now, collect bits and pieces of flowers, seeds, grasses and other things you find and stick them on the bracelet. I like this project because it really tunes you into the variety of plant-life growing around you. Just brilliant! Can't wait to share this with my kids when they wake up tomorrow! Hello, I'm the photo editor for a children's magazine, who has a website. 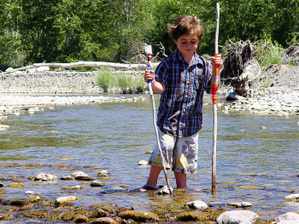 On it we would like to mention your wilding sticks and use one image of the boy with the sticks wadding in the water. We would need a copy of the image. Will you please email me so we can discuss this further. I am leaving town tomorrow for a few days, and I will get back to you, when I return. Those remind me of my childhood, interesting! Love these sticks--and they're so perfect because my maiden name is Wilding! Thanks so much for the idea. Me and my four year old (who's middle name is Wilding) will be making these for sure. Hello!-- I work for Kristin on her Sew,Mama,Sew! blog and we'd love to get permission to re-post your image for an upcoming series about handcrafts for children. Could you contact me via email for details? I wasn't able to locate your email on the site (though I often miss such things!). I did this project with my son yesterday and posted about it on my blog (http://icelandicbarbie.wordpress.com/) with a couple links back to your page (both the wilding sticks page and your main page)I hope that is okay. My son and I sure had a blast doing this project. Thanks! Love this craft! We just finished 'Camp Meme' last week and I would have loved to have this craft for our two grandsons. Hi there I really love reading about all the things you do with your kids . Can I ask you what do you do with all the things you make. My kids get very attached to all their art projects and the house is bursting. Especially things that are made from " nature" when the leaves crumble etc it is difficult to know what to do. We have only so much wall space! Help! 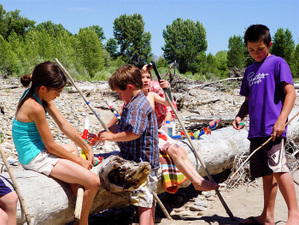 I will definetly do this with my kids this summer near the river. Fantastic! A simple idea with a lot of impact! 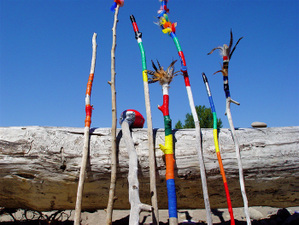 I've seen walking sticks decorated with yarn too. You put glue on the stick and then tightly wrap the yarn around. Wow - those wilding sticks would have been great at our recent garden party. You take beautiful photos and this is a lovely blog! Those look beautiful! I think we are going to do that this week. I love your ideas. These are great ideas! My children will love them. Thanks. Wonderful ideas! I love that you've combined electrical and duct tape with all the nature stuff. It's like nature meeting industry and I like it. It's also much more realistic than binding them with rawhide or some such stuff. I've got duct tape and electrical tape, so this is very doable. In fact, we might go do it now.